ww2dbaseHarry Lloyd Hopkins, an American social reformer, politician and administrator, was born in Sioux City, Iowa, United States, the son of a harness maker. He was educated at rural Grinnell College, Iowa, where its noted liberal commitment to social responsibility could be largely responsible for his later career path. 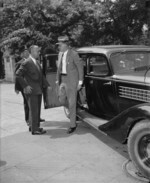 During the Great Depression, Governor Franklin Roosevelt of New York appointed Hopkins as the acting director of the New York State Temporary Emergency Relief Administration. From the earnest and single-minded social reformer Hopkins now became one of the leading administrators of the "New Deal" (a series of programmes, public works projects and financial reforms introduced from 1933 in response to the Great Depression) and, during World War II he became a trusted emissary on diplomatic missions of the highest importance. After his 1932 election victory, President Roosevelt appointed Hopkins as the Federal Relief Administrator tasked with alleviating poverty and creating employment opportunities. In 1938 President Roosevelt appointed him Secretary of Commerce, a post he would hold until 1940. Later, as virtual secretary to the Inner War Cabinet, the lanky unkempt Hopkins would become a personal assistant to Roosevelt, enjoying the President's trust and becoming his closest confidant. ww2dbaseA behind-the-scenes master of organisation, administration and forward planning, the gaunt lean mid-westerner, in rumpled loosely hanging clothes, would be a major player in the Roosevelt team. Both as Secretary for Commerce and subsequently as Chairman of the Munitions Assignment Board in addition to participating with other groups in directing the war effort. Hopkins transferred ably to the task of the President's roving ambassador/negotiator. In January 1941, Roosevelt sent him to London as his personal emissary to line up the Lend-Lease agreement and then to Moscow to chart Russia's war needs. In the same year the President made him head of Lend-Lease Administration. ww2dbaseFrom the day of his arrival in London (9 January 1941 - in the middle of a heavy German air raid), Hopkins' purpose was to find out what made the British tick. He set to work with a will. In thirty-one days he talked to 300 men and women around the country and quickly acquired a strong admiration for Winston Churchill's will to resist. Nevertheless, he felt that the British government was expecting rather too much in the form of Lend-Lease on an unprecedented scale. In vain he pointed out to his hosts that only Congress could declare war, and that many US politicians were known to be hostile to this concept. Then, on Friday, 17 January 1941, after returning from an inspection of the Home Fleet at Scapa Flow with Churchill, the President's emissary attended a select private dinner party at the four-star North British Railway Hotel in Glasgow, Scotland, United Kingdom hosted by the Secretary of State designate for Scotland, Tom Johnston, with the Prime Minister as his guest of honour. Invited to address the company, Hopkins made a historic pledge of American support to Great Britain. Sir Charles Wilson, who was present, would reveal that, at this disclosure, the Premiere broke down and was seen to be weeping unashamedly. Churchill's cause for emotion reveals that he clearly understood that this unexpected statement symbolised Roosevelt's determination to support Britain and her Allies by all means, short of war. Churchill, in fact, much impressed by Hopkins' often tactless and irrelevant manner would dub the American as "Lord Root-of-Matter". ww2dbaseThen on 9 February 1941, after weeks of debate in Washington, United States by the House Foreign Affairs Committee and the Senate Foreign Relations Committee, the House passed by 260 votes to 165 the House Bill 1776 – "A Bill to further promote the defence of the US and for other purposes". The Isolationist's arguments were finally put to an end when Senator Wendell Wilkie returned, on 11 February, to Washington after a fact-finding mission to England - He told the Senate Committee that the last thing the British desired was an American Expeditionary Force in Europe. Roosevelt's Lend-Lease plan had finally been achieved. ww2dbaseHopkins flew to Moscow, Russia on 30 July 1941 for two meetings with Joseph Stalin. The Soviet leader told him confidently "Give us anti-aircraft guns and aluminium and we can fight for three or four years". In reality the Western Allies would eventually deliver shipments of more than 17.5 million tons of supplies to Russia from 1941 to 1945, including large quantities of vehicles (mostly Studebaker trucks) and 1,900 locomotives. The United States alone supplied 43% of Soviet tyres as well as 56% of rails for the Soviet railways, 58% of high octane aviation fuel, approximately one-third of Soviet explosives, four fifths of all copper, 328,000 tonnes of aluminium, and enough canned food to provide each Russian soldier with a meal a day (although, unsurprisingly, not all would reach the men serving in the front line). ww2dbaseHarry Hopkins returned from Moscow in time to accompany Churchill aboard the battleship HMS Prince of Wales destined for the Premiere's first meeting with President Roosevelt at Placentia Bay, Newfoundland. While the two leaders entertained each other, and dined lavishly (including caviar and vodka which Hopkins had brought as a present from Stalin), served by white-coated Royal Marine waiters, their respective staffs worked feverishly to draft the Atlantic Charter to define the Allied goals for a post war world. Although America's entry into the war still remained four months away the groundwork was being done for mutual co-operation even though the President remained adamant not to involve his country in a European war. ww2dbaseHopkins became Roosevelt's spokesman at many of the Allied Conferences later in the war. At the Casablanca Conference he sought to bring Charles De Gaulle and Henri Giraud together, and at the Yalta Conference and the Tehran Conference applied himself to the post-war allocation of European territory. After Roosevelt's untimely death on 12 April 1945, Hopkins went once again to Moscow as President Harry Truman's envoy and was instrumental in securing an agreement with Stalin over the future of Poland. His good relationship with the Russians, despite being much criticized in the United States following his own death, would also form a partial solution to solving the UN veto disagreements when that problem occurred during the San Francisco Conference which took place from 25 April 1945 to 26 June 1945.
ww2dbaseThroughout the war, Harry Hopkins had not enjoyed good health, but he nevertheless had kept steadfastly at his work. He had already survived a major operation for stomach cancer and suffered from chronic liver deficiency and pernicious anaemia, kept alive by twice-monthly blood transfusions. The strain the Moscow journey put on his health now prevented him from attending the meeting of the representatives of the three major Allies in Berlin in July 1945, and he died, probably from stomach cancer, five months later in New York, New York, United States at the age of 55. His body was cremated and his ashes interred at the Hazelwood Cemetery in Grinnell, Iowa, United States. 17 Aug 1890 Harry Hopkins was born in Sioux City, Iowa, United States. 9 Jan 1941 Harry Hopkins, President Roosevelt's personal envoy, arrived in England, United Kingdom. 30 Jul 1941 Harry Hopkins arrived in Moscow, Russia. 8 Apr 1942 A US delegation led by Harry Hopkins and George Marshall arrived in Britain to discuss US and British strategy on opening a second front in Europe by invading France. 29 Jan 1946 Harry Hopkins, one of Franklin Roosevelt's closest advisers and a key policy maker in creating the Lend-Lease Act, died of stomach cancer in New York, New York, United States. Hunting for a project titled "Winona"